Are You Partly To Blame For An Iowa Motorcycle Crash? 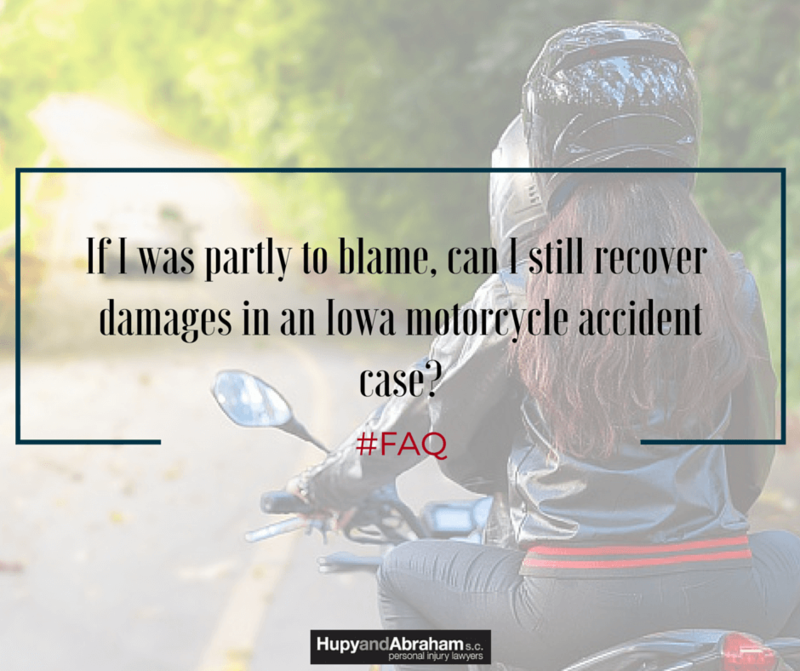 | Hupy and Abraham, S.C.
Can I still recover damages in an Iowa motorcycle accident case if I was partly to blame for the accident? Few accidents are clear-cut with 100 percent of the liability resting with just one driver. Real life is complicated; while the other driver may have been primarily responsible for the crash, you may have also been partly at fault. You may recover damages if you were partly at fault for the accident, but not primarily at fault. In other words, your portion of the fault must be 50 percent or less. Your damages may be reduced by the percentage of fault attributable to you. For example, if you were 30 percent at fault for the crash, then your total damages would be reduced by 30 percent, because it would not be fair to require the other driver to pay for your mistake. If the other driver or his insurance company can establish that you were partly to blame for the accident, then you should expect that driver or insurance company to argue that you were responsible for a larger percentage of the accident than you believe is true. By making this argument, the other party will try to lower the amount it has to pay to you. You will have to provide strong evidence that proves what happened during the crash and you will benefit from having a skilled lawyer advocate on your behalf. That way, you can make sure that your rights are protected and that you get the fair recovery that you deserve—even when the situation is complicated. Don’t let your own potential liability prevent you from contacting an experienced Iowa motorcycle accident lawyer for a free consultation. You deserve to find out the truth about how an Iowa motorcycle case works and about how to protect your recovery. Call us today at 1-800-800-5678 or start an online chat with us now to learn more.